The European Parliamentary elections are on their way, and throughout Europe parties are mobilizing to campaign. How do youngsters see the green future of Europe? In this series you’ll meet political youth parties from all over the continent: from Spain to Slovenia. Today we’re speaking with Igor Jurišič, partyleader for Stranka mladih – Zeleni Evrope from Slovenia, who is concerned by our growing waste problem and encourages youngster to find their voice. According to Igor, the most important sustainable topic for the EU is waste management. The amount of waste we produce increases day by day, and more and more waste cannot be recycled. However, instead of focussing on the scale of the problem, Igor notices that companies make their packaging as easily recyclable as possible. Unfortunately, we will be left fighting a running battle if we do not tackle the scale of the problem. “I believe it is better for the environment if we use only one bottle than if we have the optimal recyclable bottle and we throw it away every day.” Igor believes it is as easy as looking back to how we used to consume in the past. Simply bring your own containers to the store, or buy in bulk. Nonetheless, Igor emphasizes that this approach requires not only a change from consumers, but most of all a change from producers. As a consumer, you may want to engage in sustainable consumption, but if companies don’t facilitate that it’ll be pretty hard. Igor uses the simple example of a ball point pen to demonstrate the impact producers have on our consumption. You can only produce minimal waste if the producer designs a ball point pen, which you can easily disassemble and replace the ink in, instead of throwing away the whole pen when it’s finished. Legislation should push the producers to start thinking this way. “We need to make it easier for companies who are working environmentally-friendly, and we have to levy higher taxes on non-eco friendly products.” This approach touches the core of businesses: making a profit. What role does the Slovenian youth play in pushing for this legislation? When I ask Igor whether politicians really listen to youth, Igor tells me that they usually listen, but that youngsters don’t always voice their opinion. Young people only take action when the situation has become dire, but Igor finds it so important that they be heard on more mainstream topics too. Aoife Fleming is a law student at Leiden University in the Netherlands. 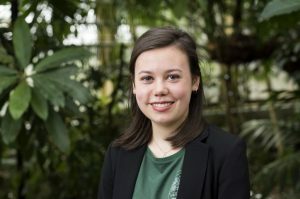 Through her work for the Green Office, and a project focussed on sustainability in legal education Aoife aims to have an impact on the world around her.